To make the most efficient use of memory and of radio bandwidth, Sifteo Cubes have a multi-level hierarchy of storage types, utilizing several special-purpose data compression codecs. 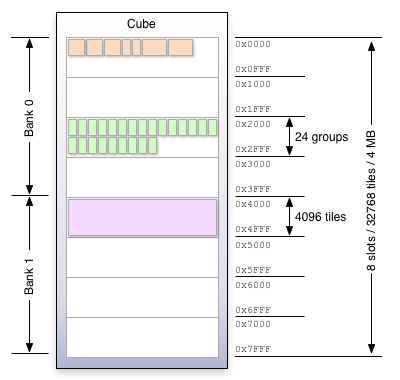 This is an advanced guide which describes the memory management architecture for graphics data on Sifteo Cubes. We assume familiarity with the Graphics Engine and Asset Workflow. This is the largest storage device in the system, capable of storing all persistent data for several games. A game's entire .ELF binary image resides here. Main Flash is large, and it may be written to at runtime using the Sifteo::StoredObject class. Main Flash is being used continuously by the system, to fetch music and executable code as well as graphics data. All of these accesses occur via a shared cache in RAM. 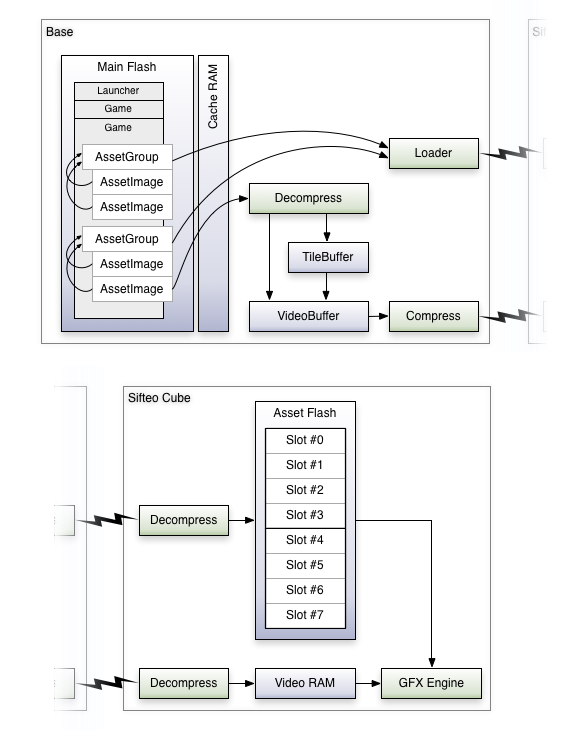 AssetGroup data (tile pixels) are stored in a compressed format which can be decompressed autonomously by a Sifteo Cube into its own local Asset Flash. AssetImage data (tile indices) are stored in one of several supported formats, including a raw uncompressed (flat) format, or a block-oriented compression codec (DUB). Each AssetImage references tile data from exactly one AssetGroup. Any time you draw an AssetImage, it is streamed from Main Flash, and decompressed either into a temporary Sifteo::TileBuffer, or into a Sifteo::VideoBuffer. TileBuffers may be used to cache decompressed AssetImages in RAM, in order to reduce the amount of time spent decompressing or loading data from Main Flash. This is a medium-sized storage device located on each individual Sifteo Cube. Asset Flash stores only uncompressed graphics data. In tandem with Video RAM, this memory drives the cube's graphics engine. 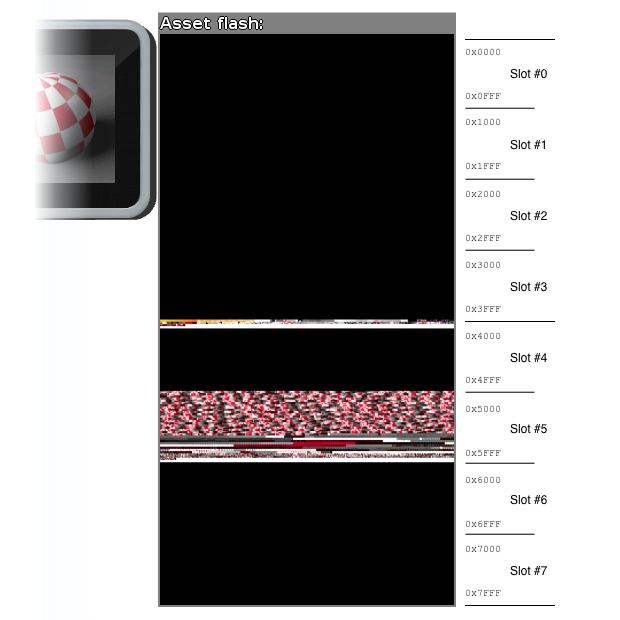 Asset Flash is extremely fast for the graphics engine to read, but it's slow to write. The only way to write to Asset Flash is by sending compressed pixel data over the radio. This pixel data is part of a Sifteo::AssetGroup. It has already been encoded by stir. Asset Flash is persistent. After loading a Sifteo::AssetGroup, that group remains installed until it is removed or that memory is recycled by the same or a different game. The allocation of Asset Flash to individual games takes place using asset slots. The Sifteo::AssetSlot object is the basic unit of allocation for Asset Flash. Each Sifteo::AssetSlot is equal to 4096 tiles, or 512 kB of memory. Each Sifteo Cube has a total of 8 slots, or 4 MB. Due to hardware limitations, only half of this (4 slots) may be used at once. This, therefore, is the maximum number of Sifteo::AssetSlot objects which may exist in one game. The binding between a game's virtual asset slots and a per-cube physical asset slot takes place when loading a game, just prior to installing any bootstrap asset groups. The binding is arbitrary, and may be different for each cube. The system always reserves one physical asset slot per cube for each virtual asset slot in the game. An AssetSlot may hold at most 4096 tiles or 24 AssetGroups. One of the goals of asset memory management should be to reduce or eliminate user-visible loading time. One way to accomplish this is to allow asset loading to begin before a game actually starts executing. Games may mark an AssetGroup as "bootstrapped", indicating that the game is expecting that group to be available in Asset Flash before the game begins executing. Bind three virtual asset slots to physical asset slots. If possible the same physical slots will be reused, and any already-loaded AssetGroups will remain. If not, new empty physical slots will be assigned. Load BootstrapGroup into MainSlot. There may be other assets in MainSlot already. These other assets are not removed unless the space is needed to install BootstrapGroup. This loading operation may happen concurrently with other animation or user interaction in the system launcher. Transfer control to the game's binary. Bootstrapping is so named because it's intended to install a very minimal amount of asset data, just enough to display a title screen or main menu typically. For the best user experience, bootstrapped asset data should not take longer than a fraction of a second to install. 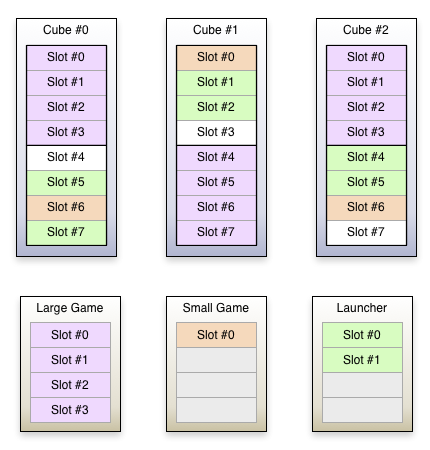 Since much of the asset memory management process occurs automatically, it can often be useful to have additional visibility into how your cube's asset slots have been assigned, or how a game is managing the groups loaded into its slots.